Algae for biofuels: Moving from promise to reality, but how fast? A new report from the Energy Biosciences Institute (EBI) in Berkeley projects that development of cost-competitive algae biofuel production will require much more long-term research, development and demonstration. 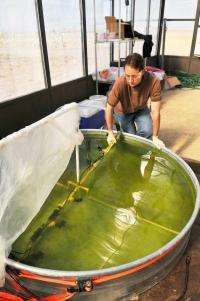 In the meantime, several non-fuel applications of algae could serve to advance the nascent industry. "Even with relatively favorable and forward-looking process assumptions (from cultivation to harvesting to processing), algae oil production with microalgae cultures will be expensive and, at least in the near-to-mid-term, will require additional income streams to be economically viable," write authors Nigel Quinn and Tryg Lundquist of Lawrence Berkeley National Laboratory (Berkeley Lab), which is a partner in the BP-funded institute. Their conclusions stem from a detailed techno-economic analysis of algal biofuels production. The project is one of the over 70 studies on bioenergy now being pursued by the EBI and its scientists at the University of California at Berkeley, the University of Illinois in Urbana-Champaign, and Berkeley Lab. The algae biofuels industry is still in its early gestation stage, the new report notes. Although well over 100 companies in the U.S. and abroad are now working to produce algal biomass and oil for transportation fuels, most are small and none has yet operated a pilot plant with multiple acres of algae production systems. However, several companies recently initiated such scale-up projects, including several major oil companies such as ExxonMobil (which a year ago announced a $600 million commitment to algae biofuels technology), Shell (with a joint venture project, "Cellana," in Hawaii), and Eni (the Italian oil company, with a pre-pilot plant in Sicily). The U.S. Department of Energy has funded several R&D consortia and pilot projects, and one 300-acre demonstration project in New Mexico, by Sapphire Energy, Inc. The U.S. Department of Defense is supporting several fast-track projects. In the United Kingdom, the Carbon Trust has initiated a 10-year effort to develop algae oil production, engaging a dozen universities and research laboratories, while the European Union recently funded three 25-acre pilot projects. Most of these projects use the raceway, open pond-based algal production technologies, which were analyzed in the EBI Report. These projects hope to show that it is possible to mass culture algae with current or near-term technology within the technical and economic constraints required for biofuel production. Once the technologies are developed, global resource availability will be a major controller of algae production, the report states. Four key resources (suitable climate, water, flat land and carbon dioxide) must all be available in one location for optimal algal biomass production. The authors state that despite the need for all four resources, algal oil production technology has the potential to produce several billion gallons annually of renewable fuel in the U.S. However, achieving this goal, particularly at competitive capital and operating costs, will require further research and development. The EBI report focuses on algal biofuels produced in conjunction with wastewater treatment as a promising cost-effective strategy to fast-track development of a practical production process. Besides providing the needed water and nutrients, use of wastewater in algae production provides the potential for income from the treatment service provided. The areas the study identified as essential for R&D are in both the biology and engineering fields. The ability to cultivate stable cultures under outdoor conditions, while achieving both high productivities and oil content, is still to be developed. Despite the well-known rapid growth rate of algae, increasing the volume of algae oil produced per unit of surface area per year is a crucial goal. Oil-rich algae strains that are biologically competitive with contaminating wild species and that consistently grow well in various climates are needed. Other key steps to be improved are low-cost harvesting of microscopic algae cells and the extraction of their oil content, as well as dealing with the biomass residue remaining after oil extraction. The report's analysis includes five conceptual facilities for algae pond biofuel production, four of them 250 acres in size and one of 1,000 acres. All used municipal wastewater as the source of both water and nutrients, with some emphasizing production of oil, while others have wastewater treatment as their main priorities. Biofuel products included either biogas and oil or just biogas production, with the biogas used for electricity generation. The hypothetical location was the Imperial Valley in southern California, where the only major microalgae farms in the continental U.S. are presently located. In the scenarios, productivity peaks in the summer months but is essentially nil in the coldest winter months, with light and temperature being the main limiting factors. Engineering designs and cost analysis for the various cases were based on projecting current commercial microalgae production and wastewater treatment processes at much larger scales. They assumed higher productivities due to plausible technological advances. The estimated capital costs for a 250-acre biofuel production system emphasizing oil production were about $21 million, with annual operating costs at around $1.5 million, to produce about 12,300 barrels of oil, giving a break-even price per barrel of oil of $330 (based on an 8 percent capital charge). Increasing the scale of the system to 1,000 acres reduced the break-even price to about $240 per barrel. These prices considered wastewater treatment credits, which reduced costs about 20 percent. Other facilities that maximized wastewater treatment produced fuel at lower cost due to greater treatment revenue. However, the availability of wastewater would greatly limit the national scale of this lower-cost fuel production. Other co-products, specifically animal feeds, could help offset costs, but these products are of relatively low value or have very limited markets. "Wastewater treatment is the only realistic co-product for (algal) biofuels production," the report states. "Only through intensive, continuous, large-scale research with outdoor ponds can we hope to progress in a reasonable time frame." The EBI scientists conclude that "algal oil production will be neither quick nor plentiful  10 years is a reasonable projection for the R, D & D (research, development and demonstration) to allow a conclusion about the ability to achieve, at least for specific locations, relatively low-cost algal biomass and oil production." Wonder if this logic extends to hydroponic algae and/or algae engineered to consume plant cellulose? A major problem to open-pond farming is that you get contaminated with all kinds of algae species that you don't want and have to expend a lot of resources to guard against.